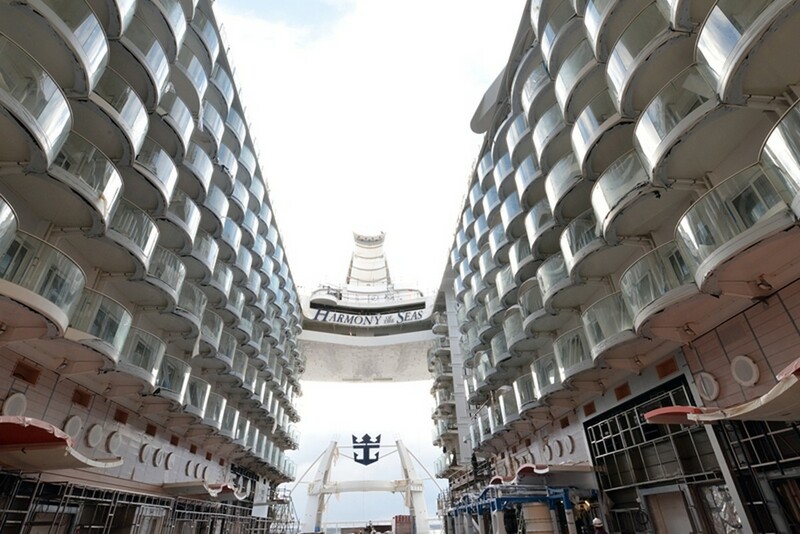 Royal Caribbean has filed a trademark with the United States Patent and Trademark Office for "Symphony of the Seas", which seems to confirm the name that has been rumored for the cruise line's fourth Oasis class cruise ship. 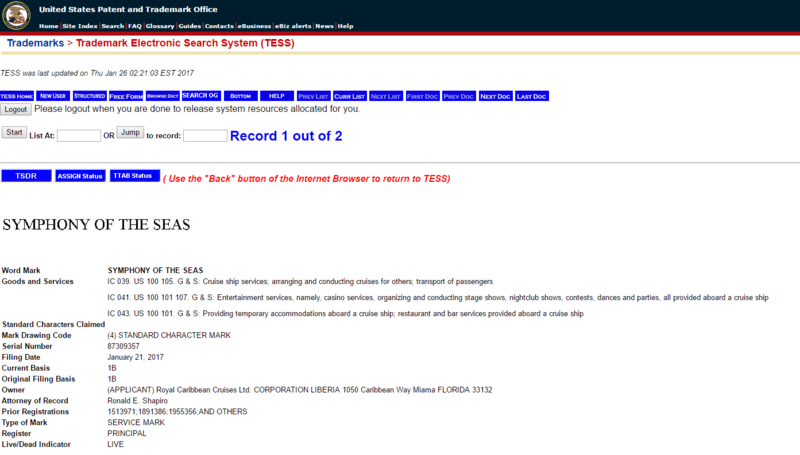 Royal Caribbean filed the trademark application on January 21, 2017 and it is currently active. Royal Caribbean has not officially confirmed the name of its fourth Oasis class cruise ship, which is due out in Spring 2018. 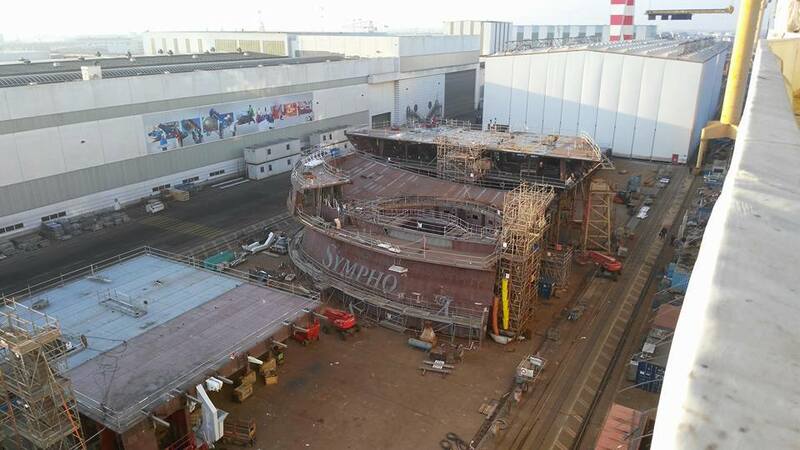 There have been a few different convincing rumors this month that seem to point to the name of the ship being Symphony of the Seas, including a construction site photo taken of the ship's name being prepared. There appears to be photographic proof of what Royal Caribbean's next cruise ship will be named. A photo was shared by Royal Caribbean fan and avid ship construction fan, Lloyd Marchand from the STX France shipyard that shows a piece of Royal Caribbean's fourth Oasis class cruise ship with the outline for what will be the ship's name. The letters begin to spell out the rumored name, Symphony of the Seas. Earlier this week, a partner company accidently posted Symphony of the Seas as the name of the new ship on its blog. Royal Caribbean has not formally announced the name of this ship yet, although we do know it will debut in Spring 2018. It looks like the name of Royal Caribbean's fourth Oasis class cruise ship may have been leaked by a partner company that works with the cruise line. FlowRider touted the work it is doing with its largest client, Royal Caribbean, and repeatedly referred to the fourth Oasis class ship as Symphony of the Seas. 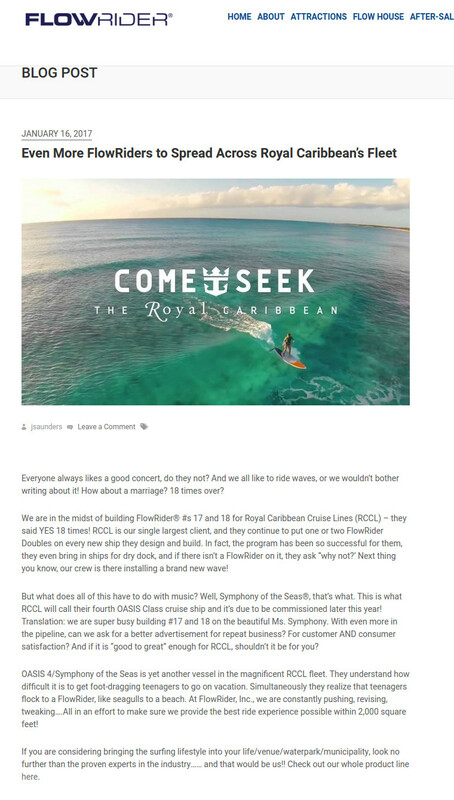 The blog post mentions the new ship in reference to the the fact it will have a FlowRider onboard, "But what does all of this have to do with music? Well, Symphony of the Seas®, that’s what. This is what RCCL will call their fourth OASIS Class cruise ship and it’s due to be commissioned later this year! Translation: we are super busy building #17 and 18 on the beautiful Ms. Symphony. With even more in the pipeline, can we ask for a better advertisement for repeat business? For customer AND consumer satisfaction? And if it is “good to great” enough for RCCL, shouldn’t it be for you?" Royal Caribbean has not officially announced the name of its fourth Oasis class ship yet. Oasis 4 is under construction in STX France and will join Royal Caribbean's fleet in spring 2018.
Credit for spotting this news goes to Harmony of the Seas Facebook group first. Read more about Is Royal Caribbean's fourth Oasis class ship named Symphony of the Seas? Royal Caribbean International CEO Michael Bayley confirmed in an interview that Royal Caribbean's next new cruise ship will be coming to the United States, following a brief European summer season. In an interview with the Miami Herald, Bayley was questioned about cruise growth, and mentioned plans for the yet unnamed fourth Oasis class ship. 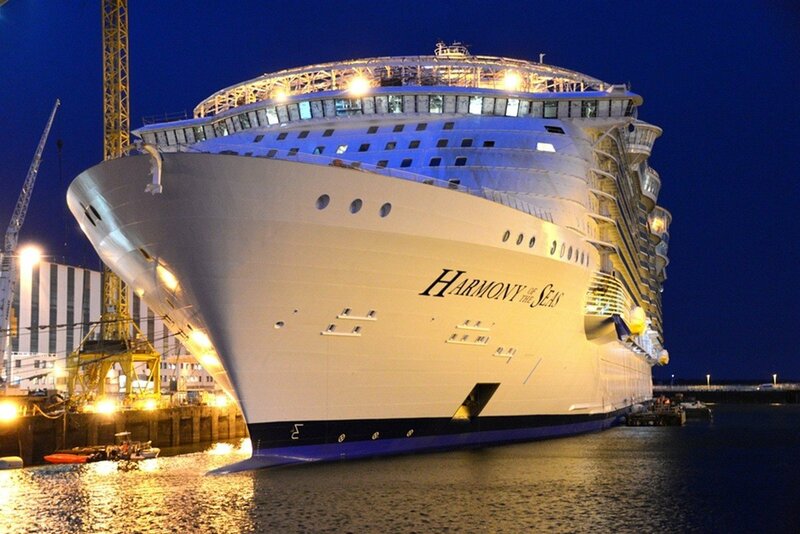 "In 2018, the sister ship of Harmony of the Seas will be launched in Europe and will come to the U.S."
This plan mirrors the plan for sister ship, Harmony of the Seas, which also did a summer season in Europe prior to her arrival in the United States. Bayley also referenced the fourth Quantum class by a name that we have not heard before, "In 2019 we have Quantum Plus". 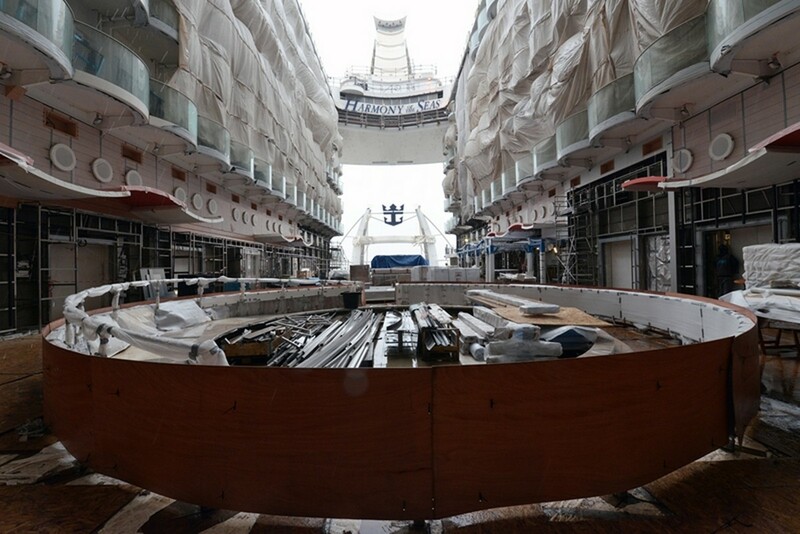 Royal Caribbean has released new photos, showing the construction progress of two of its newest cruise ships, Harmony of the Seas and and its fourth Oasis class ship. 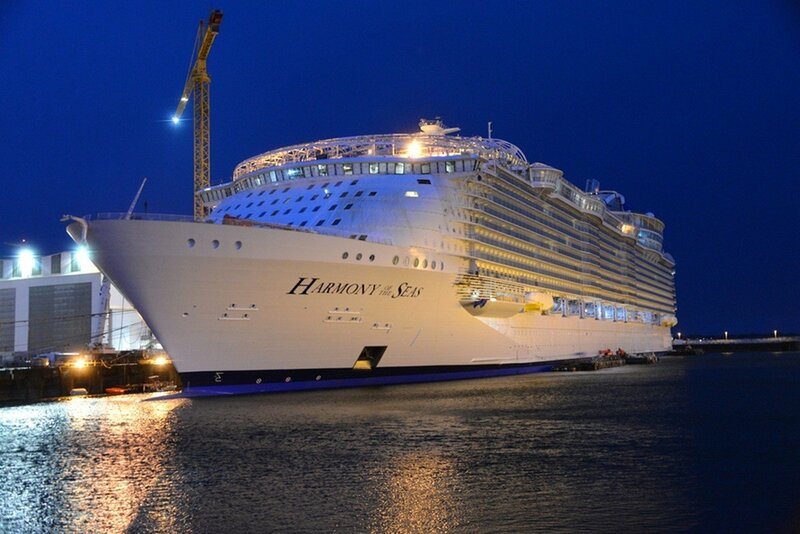 Harmony of the Seas is under construction at the STX ship yard in France and will debut in May 2016. 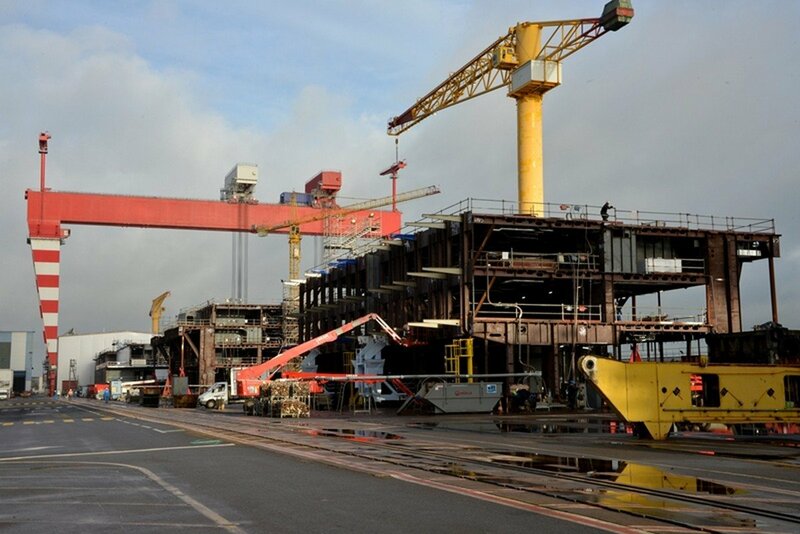 Royal Caribbean's fourth Oasis class ship is under construction at the STX shipyard in France. All photos are copyright Royal Caribbean International. 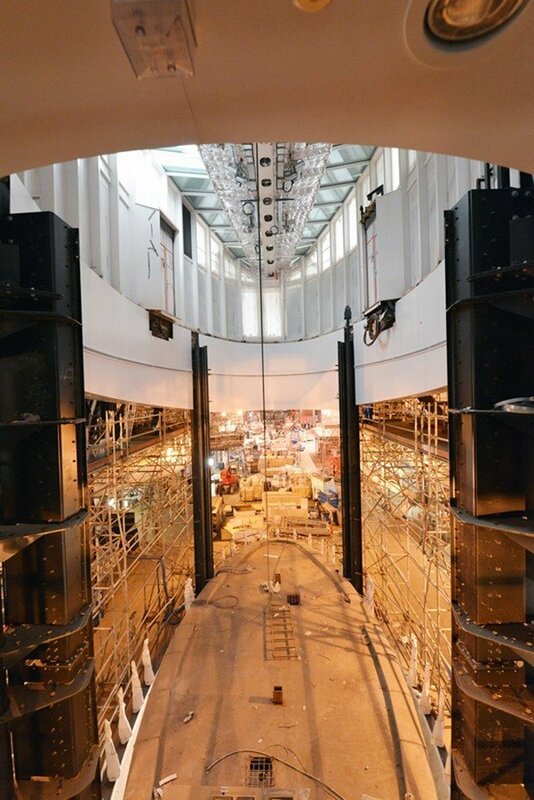 Royal Caribbean has released two new photos showing off the construction progress being made on its fourth Oasis class cruise ship. 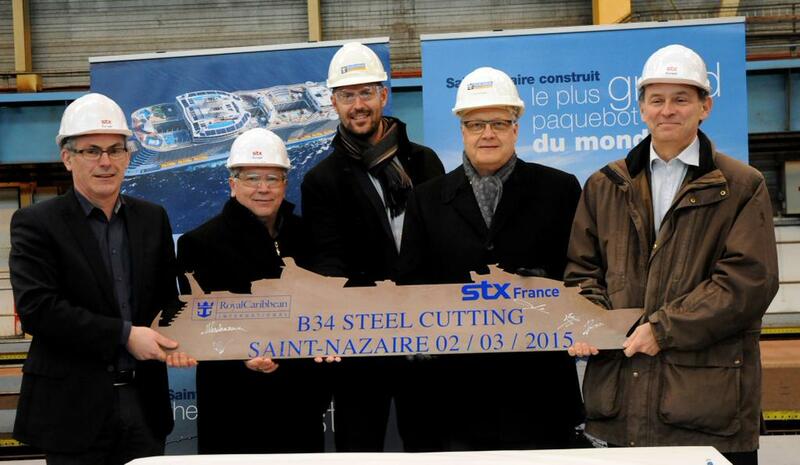 The unnamed ship is under construction at the STX ship yard in France and will debut in mid-2018. 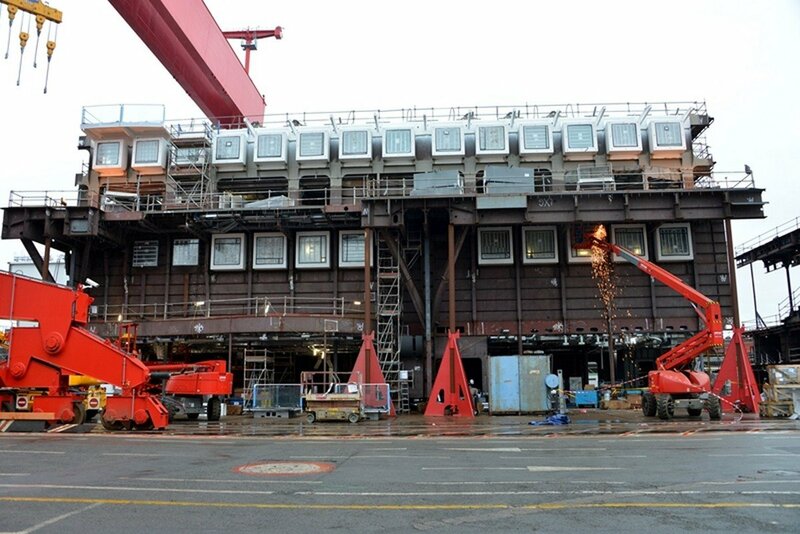 The photos were taken in November 2015 at the STX shipyard in St. Nazairre, France. All photos are copyright Royal Caribbean International. 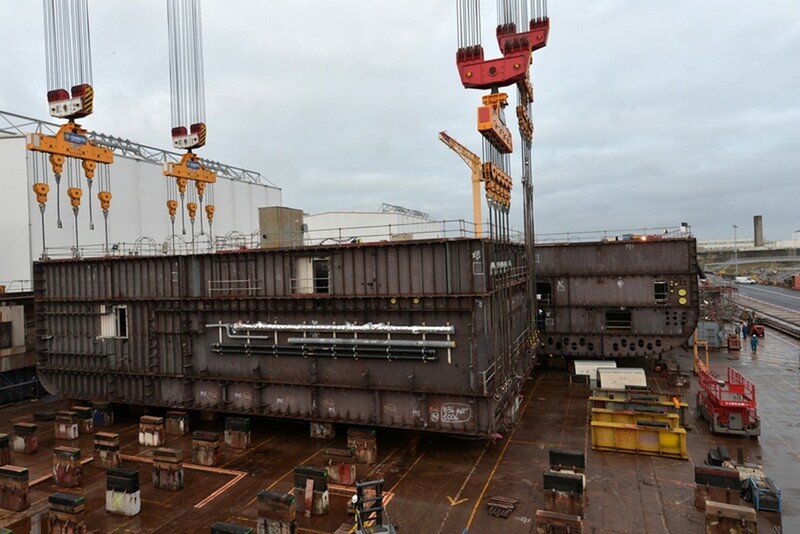 Royal Caribbean's fourth Oasis class cruise ship had her keel layed today at a ceremony at the STX France shipyard in Saint-Nazaire, France. The keel-laying marks the official start of construction for Royal Caribbean's unnamed fourth Oasis class ship. During the ceremony, a 1,000-ton block measuring 32-ft by 154-ft (10 x 47 meters) was lifted by crane into the building dock. 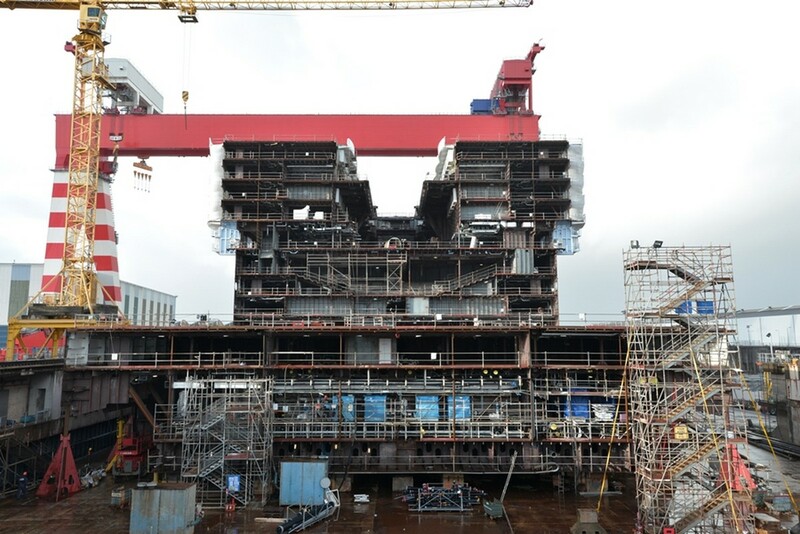 Newly minted coins were placed under the keel and will stay in place there until the end of the ship’s construction. Once the ship is near to completion, the coins are retrieved and presented to the ship’s Captain and crew to be placed onboard the ship. According to maritime tradition, the coins are said to bring luck to the ship during its construction process and then to its Captain and crew when she is sailing out at sea. Special thanks to Lloyd Marchand from the Oasis 4 Facebook group for providing these photos. The fourth Oasis class ship is scheduled for delivery in spring 2018. 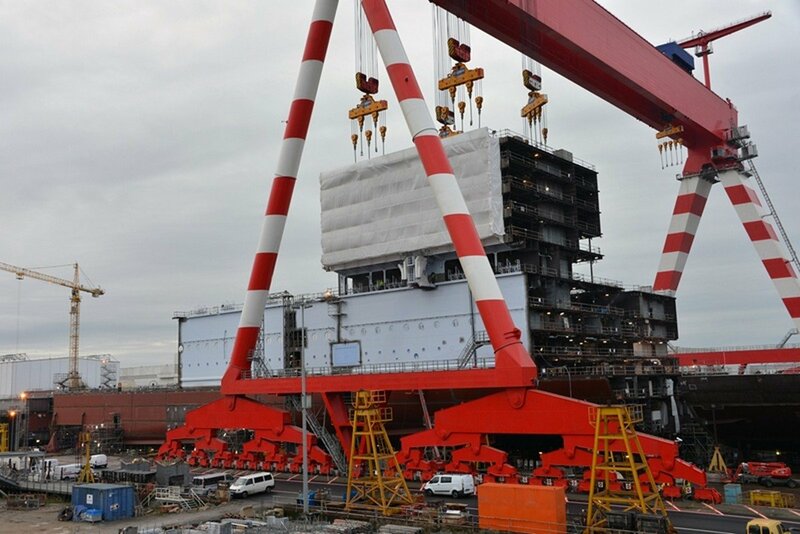 The first block of Royal Caribbean's fourth Oasis class cruise ship arrived over the weekend at STX France shipyard in Saint-Nazaire, France. 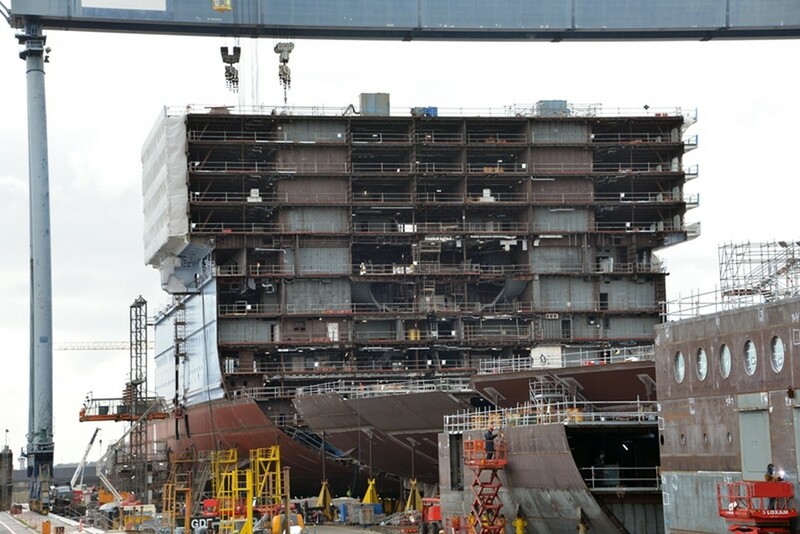 The block is just one part of the overall structure of the ship. It and other blocks will be put together later to form the ship. Royal Caribbean has not announced a name yet for the ship. The first steel cutting occured in February 2015. The fourth Oasis class ship will debut in mid-2018. Royal Caribbean's fourth Oasis-class cruise ship took a major step forward today when it had its steel cutting ceremony earlier today at STX France in Saint-Nazaire, France. The steel cutting marks the official start of construction for any cruise ship. Royal Caribbean promises more details about this and sister third Oasis-class ship will be reveleaed in the coming months. The unnamed Oasis-class ship will debut in mid-2018 but it's just one of a few Royal Caribbean ships under construction. 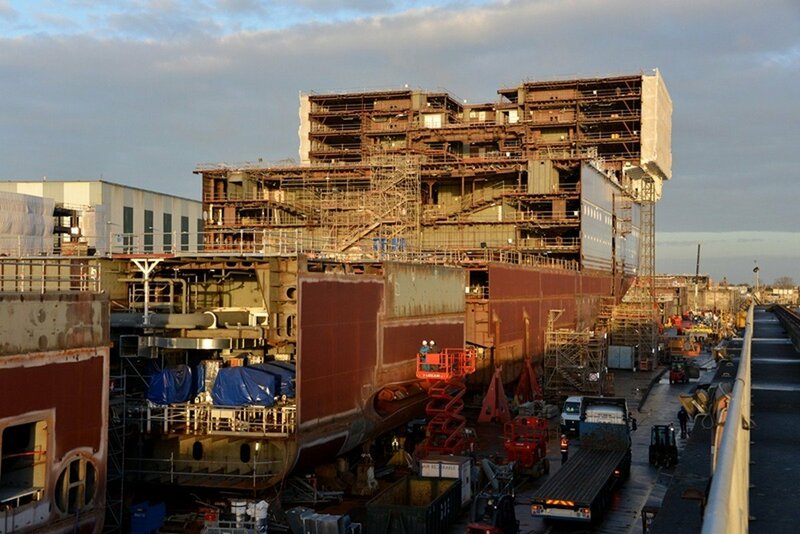 Anthem of the Seas is almost complete and will be ready for an April 2015 launch, followed by a third Oasis-class and Ovation of the Seas (Quantum-class), which will both debut in spring 2016.